***The end to the Dallas Mavericks' season also ended up being cable television's third most-watched attraction last week. The Mavs' May 3rd, sixth game blowout loss to Golden State attracted 4.8 million viewers nationally on TNT, trailing only HBO's The Sopranos (7.2 million) and the 9 p.m. Monday portion of USA network's WWE Raw (5 million). 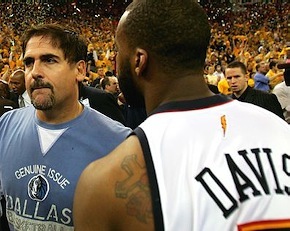 Game 5, which Dallas won thanks to last-minute heroics by Dirk Nowitzki, ranked fifth with 4.2 million viewers. 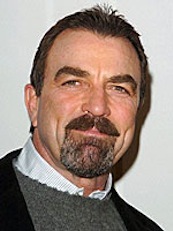 ***NBC has signed Mr. Magnum, P.I., Tom Selleck, to join the cast of Las Vegas next season. He'll play the yet to be named "charismatic, self-made billionaire" owner of the Montecito Resort & Casino. There's also an "air of mystery" about him, says the Peacock. James Caan, who played the casino's previous owner, Ed Deline, will help set these events in motion with an appearance in next season's premiere episode. Caan otherwise is leaving the series after four years. ***Fox hopes to have a long-playing American Idol spinoff with The Search For the Next Great American Band, set to premiere sometime next season. It's from Idol creator Simon Fuller, who will deploy the show's weekly vote-off format to find "the next American band sensation that will take the nation by storm." For more info, go here. ***Replays of the 2007 Quarterback Bowl charity event, starring former Dallas Cowboys players and personalities from Dallas' KTCK radio (1310 AM, "The Ticket") can be seen anytime via Time Warner cable's digital On Demand channel. Select METRO SPORTS and then QB BOWL. ***NBC's Saturday Night Live wraps its 32nd season this weekend and next with guest hosts Molly Shannon (May 12) and Zach Braff (May 19). Respective musical guests are Linkin Park and Maroon 5. ***Even the very mighty aren't immune. HBO chairman and CEO Chris Albrecht has resigned after being arrested on charges he assaulted his girlfriend in a Las Vegas parking lot. Albrecht, a recovering alcoholic, said in an email to his HBO colleagues that he had been sober for 13 years but recently lapsed. His resignation came shortly after The Los Angeles Times reported that in 1991 HBO paid a settlement of at least $400,000 to a former employee who had accused Albrecht of choking her on the job. In a statement from HBO's parent company, Time Warner, Albrecht said he stepped down "for the benefit of my Home Box Office colleagues, recognizing that I cannot allow my personal circumstances to distract them from the business."